Since the 1870s Montana ranch hands have worked cattle along the banks of Bonanza Creek. A century later, we've set a place at the table for you. The ideal place to tailor your dreams -- Come ride with us; help us gather cattle; test your skill against the feisty trout; catch the wildlife on camera; or just relax and enjoy the gorgeous scenery. Ride to your ability. No head-to-tail riding. Our four cabins await you. Great home cooking and lots of it. We welcome the visitor who is seeking quiet, comfort, and great riding. 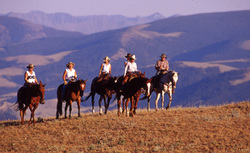 Recently in Travel & Leisure as one of the Great Guest Ranches in Montana. Directions: Bonanza Creek Country Guest Ranch is located out of Martinsdale, Montana. Turn west onto Highway 294 for 12 miles. Turn into Lennep (a country school, church, and several homes). Follow the gravel road past the church for 6 miles and you're here!